Since the real blogger STILL not blogging, I thought I would put these pictures up for you to view. Maybe the real blogger can post the pictures she wants the world to see. 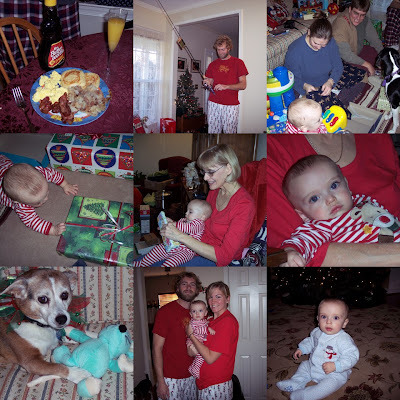 Notice the mom ( top right picture ) looking for the Size of Teddy's new PJ bottoms (our traditional matching PJ bottoms on Christmas Eve.). Guess what Mom, They are home made and made to fit, there is no size. Hopefully the real blogger will start participating shortly. "my favorite great aunt neva" is delighted to see her pajamas on the little guy!!! Nice pictures....looks like a good time was had by all!!! good pictures, but what does the grandmother think about her grandchild? we haven't heard from her so us as an audience has no gauge of how she feels about it. We know how the mystery blogger feels about it, he loves him so much that he BLOGS!